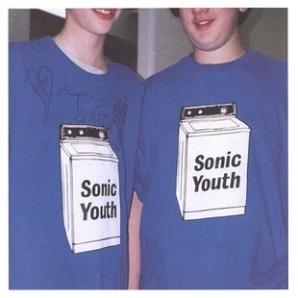 That’s what Lee Renaldo shouts at the end of this spoken-word piece with guitars, bass and drums near the end of Sonic Youth’s last universally acclaimed album. It’s not really about the future, but rather about seeing a band stumble through a live performance. But, to me, that “Hello, 2015” felt like a declaration of purpose. “Hello 2015!” Lee Ranaldo screams, somewhat optimistically, near the end of this record, just before they launch us on a sparkling sailing voyage towards that very year. It’s like, for the first time, they’ve really considered their place in our past and, more importantly, in their future. And they like what they see. And if they keep making records this strong and loose, they just might meet themselves on the other side. In 1995, when Washing Machine came out, 2015 seemed an impossible distance away. Another century, another millennium, another universe. And yet, out of all of the bands active in 1995, I was sure that Sonic Youth was going to be one of the ones still standing here on New Years Day 2015 and shout back “Hello, 1995” as they did an All Tomorrows Parties set of Washing Machine in its entirety. Meanwhile, 1995 still seems impossibly close, like if I turned around and walked around that corner over there, I’d be able to say hello to it. For much of 1995 I was living in Oakland and Rox was living in Hollywood, and – just like Ranaldo points out earlier in the song – LA was the most confusing place I’d ever been to. Of course, little did I know 20 years ago that by the time 2015 rolled around, I’d have been living here for over 13 years, with that initial confusion (you drive SOUTH to get to the ocean?) long since dissipated. So hello, 2015. Please be better.